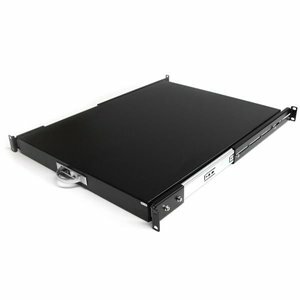 Add a sturdy, sliding shelf for easy peripheral and equipment access in your server rack or cabinet. The Black SLIDESHELFD 22in Deep Sliding Server Rack Cabinet Shelf lets you add a 2-in-1 slide-shelf / keyboard tray that helps you keep costs down and productivity up. This TAA compliant product adheres to the requirements of the US Federal Trade Agreements Act (TAA), allowing government GSA Schedule purchases.As your server cabinet needs change, the SLIDESHELFD changes to suit by allowing you to use it as a sturdy sliding shelf, or a 1U pull out drawer with a weight capacity of 55 pounds. Simply flip the installed drawer over and it becomes a shelf to hold monitors, laptops and other diagnostic equipment. An easy-to-hide handle pulls out to help you get a grip on the situation and hides away quickly.The rack shelf includes all of the tools needed for installation, and is compatible with standard 19in racks and cabinets with a 22in depth, including the StarTech.com 7236CABINET, RK2236BKF, RK4236BK, and RK4236BKNS DuraRak cabinets. Simply flip the installed drawer over and it becomes a shelf to hold monitors, laptops and other diagnostic equipment. An easy-to-hide handle pulls out to help you get a grip on the situation and hides away quickly.